earlier this week, President Donald Trump again showed his willingness to use the powers of the presidency to go after his perceived political opponents when he announced, through White House Press Secretary Sarah Huckabee Sanders, that he was considering revoking the security clearances of six former national security officers who have criticized his presidency. The group includes former FBI Director James Comey and former CIA Director John Brennan, along with President Obama’s former national security adviser Susan Rice. With all things Trump, the challenge is to distinguish the ridiculous from the dangerous. As several outlets immediately pointed out, stripping former officials of security clearances that some of them may no longer even hold shows again Trump’s destructive politics of distraction, a habit of inventing controversies to divert attention from his own latest crises. In this case, the White House was eager to muddle the news cycle in the wake of the recent Helsinki summit with Vladimir Putin where the president sided with the Kremlin rather than his own intelligence agencies on the question of Russian interference in the 2016 election. In that light, Trump’s threat to take away the clearances also demonstrates his unconcern for, and perhaps even deliberate sabotage of, the nation’s security and safety. t in the outrage over Trump’s latest assault on American democracy, what has been less noted but may be most revealing was Huckabee Sanders’ charge that Trump was considering the move because the targeted officials had sought to monetize their public service. It’s a charge Trump is, not surprisingly, quick to make because monetizing public office is exactly what he is using the presidency to do. With eerie consistency throughout his presidency, Trump’s accusations against others have been shown to be confessions. Rather than truth-telling and honest brokering in service of the country — what we’ve long expected of our presidents, even if they haven’t always delivered — Trump’s words instead are a projection of his true character and a disclosure of his own nefarious schemes. Trump views everything through the lens of profit and self-interest, so surely the people criticizing him on CNN must similarly see themselves on the opposite side of a zero-sum competition. This is the bind of narcissism: One cannot imagine that others might have sins different from their own. When it comes to profiting from his presidency, Trump’s crimes are many. Just a brief sketch suggests the pervasiveness of the kleptocracy Trump is building and how insidiously he has threaded his financial pursuits throughout the workings of his administration. Much of that swindle happens through Trump’s hotels, especially his Old Post Office hotel in D.C., booked solid since Trump entered the White House and conveniently located just down the street, and at Mar-a-Lago where the membership fees doubled right after his election. Business leaders, lobbyists and foreign dignitaries know that the best way to reach Trump is through his properties, and they have been all too happy to fill Trump’s coffers for the chance to curry his favor onsite. While most Americans will never stay at these properties, their tax dollars are regularly being sent there. The Secret Service alone has paid Trump millions of dollars to lease space in Trump Tower and to stay in his properties when he travels. Trump’s foreign deals continue to benefit the president, as well. And his children have been raking it in too. Trump’s sons, Don Jr. and Eric, who are now in charge of the family business, have been traveling the world, often blatantly mixing business with the perception that they were speaking on behalf of their father. Despite her announcement this week that she would be winding down her namesake fashion brand because of ongoing concerns about conflicts of interest, Ivanka Trump had made more than $5 million from the company in 2017 alone. In May, she secured hard-to-come-by Chinese trademarks before dining with the president of China later that day. 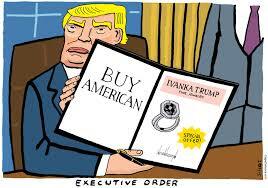 All told, Ivanka and her husband Jared Kushner made $82 million dollars last year, all while working their White House day jobs. Presidents have long made money off of their presidencies. Ulysses S. Grant established the now-standard moneymaking plan of ex-presidents when he sold his memoir to the highest bidder in 1885. Grover Cleveland joined the corporate boards of two different insurance companies, another move popular with former presidents. Even the disgraced Richard Nixon found a way to earn big dollars, nabbing $600,000 for a series of sit-down interviews with the British journalist David Frost. But as the examples point out, all these presidents had the decency — and good sense — to wait until they were out of the White House to cash in on the office. Trump has neither decency nor good sense. But he does have a knack for spotting a scam, and he understood exactly how he could use the American presidency — the most powerful office on earth — to line his pockets and protect his shady business deals from legal prosecution. Candidate Trump vowed that if elected president he’d run the government like he ran his businesses. For American voters, that promise should have disqualified him given his history of bankruptcy, fraud and numerous business failures. The real truth all along was that Trump was going to run the U.S. government as his business. After a year and a half in office, he still thinks of the presidency as nothing but an opportunity for personal gain and can’t fathom that there would be any other approach to public service. Like so many other of his enterprises, he may run this one into the ground. But that won’t stop him from making millions of dollars for himself in the process.